Christmas is in 25 days! In addition to our calendar countdown, we will be reading "The Way to the Manger: A Family Advent Devotional" by Jeff and Abbey Land. I met Abbey at church, way before I knew she was a writer. She's an incredible wife, mother, servant of God and friend. Her husband Jeff is the Children's Pastor at our church. The Lands have enriched our lives and we are honored to have their book to help us grow in our faith. 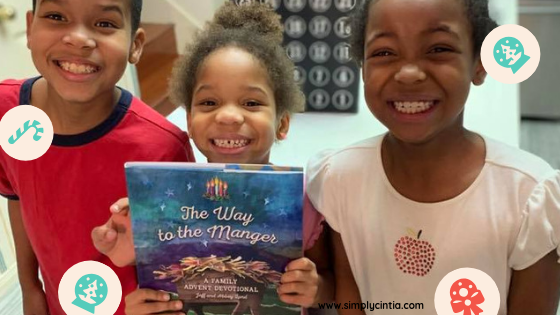 The Way to the Manger is perfect for families with kids of all ages. They walk you through the themes of hope, love, joy and peace with features and activities that will make Advent an unforgettable season. I'm not sure about your family but ours can use some help remembering what this season is all about. Growing up in Brazil, our denomination observed Advent. 20 years ago when I came to the U.S. I noticed that not every church makes a big deal out of Advent. Advent is defined as the arrival of a noble person. In our case, we anticipate the birth of Jesus. Different denominations include symbolism and traditions to this season. In our home, we become focused on Christ and all the scriptures about his birth. Each year, I take the kids to the Bible and we read the major scriptures in the new and old testament related to the birth of Jesus. I'm thankful that The Way to the Manger will serve as a gathering activity for our family. We can read Bible passages and we can reflect on what they say to us. Jeff and Abbey Land have been serving with families for a long time. I am thankful that they wrote a book that will engage us and encourage us to seek God together. You can find their book wherever books are sold. The Way to the Manger is fun for kids and adults. I love the questions my family will answer. There is room to write our answers so that in years to come we can remember previous seasons of Advent. I recommend "The Way to the Manger: A Family Advent Devotional" to every parent who wants to make sure that Jesus is the reason for the season in their hearts and homes.